I have been passionate about politics since I turned eighteen. That year, I missed the voting cutoff by a few months, so by the time another presidential election rolled around, I was twenty and excited to exercise my civic duty. And exercise it I did- voting, with my family, (as a tiny and insignificant bloc) in every city, state and federal election from then until when I made aliyah. And so as to not belabor the reveal- I am a registered Democrat but I vote Republican. Always. And if you know anything about New York City politics, it is basically casting a ballot for the loser, Every. Single. Time. No matter how crooked or inept or terrible the Democrat candidate is (cough, DiBlasio) the Republican is basically just a man in a suit, waiting to be defeated. Similarly, in these last two presidential elections, my votes have been utterly useless. To vote for the Republican in blue New York is like shoveling your sidewalk during a blizzard- you feel like you've done your part but ultimately, it makes no difference. I watched Obama get elected twice, sitting in blue, blue Queens, wishing I lived in Texas or Mississippi or better yet Florida, so my vote could actually mean something. But it didn't. I did, however, vote so often that Jury Duty notices basically came to my house daily. Then I moved to Jerusalem, Israel. I knew that I would get to vote at some point, but little did I know, the government would fold and elections would be held this March, two years earlier than scheduled. This excited me greatly, for as a citizen of Israel, I was now allowed to actually have a say in who was to be elected! After years of sideline advocating and politicking in the US, now my opinions actually have some weight behind them- now I can be a part of the action! But whom to vote for? Not to belabor another (highly obvious) point, but I am right-wing. Not crazy right-wing, as my liberal friends would accuse me of being, just regular, Israel-loving-Jewish-State-advocating-strong-defense-strategy-Judea-and-Samaria-supporting-Temple-Mount-visiting-religious-Zionist right-wing! And if that makes me a crazy right-winger, well, I guess I am! To me, it just makes sense. It's how I was raised back in NYC and has taken on an even more intense sense of rightness for me while living here. It's a matter of security and saftey, of keeping the Jewish state Jewish, with it's roots in history and it's legitimacy unquestioned. It's not apologizing for being the home of the Jews, all Jews, and maintaining it's Jewish character. To me, I live in the Jewish state, not a state that so happens to house a lot of Jews. But that's just me. Or so I thought! When I came here, I told everyone in my ulpan that my goal was to join Knesset one day and I jokingly (but not at all as a joke) remarked that I wanted to be prime minister one day. Like the next Golda Meir, except virulently opposed to socialism. Then I discovered there was a candidate and a party who literally said "No more apologizing." Stop apologizing for Israel's defense of itself, and stop apologizing for the Jewish character of this country. Stop telling residents of Judea and Samaria that they don't deserve the government's help- are they any less Israeli than those in Tel Aviv? (If I may be so bold, they love this country more than any of us!) Stop apologizing for the IDF and the way terrorists are treated- they certainly don't apologize to us for causing terror. He was saying everything that I was thinking but hadn't heard, and I was sold. Then, some reality. Elections here are very different than in the States. With so many parties (as a parliamentary system, one votes for a party and the party leader who can create the largest coalition of seats then becomes the prime minister) it's a real bloodbath. Hareidi candidates argue with one another, the Left all try to distinguish their positions and the Right all try and out-Right one another. Each of them blames the other for the country's failings and no one is ever to blame. Except Bibi. Apparently, he is to blame for everything. Now, I personally like Bibi. I think he's a brilliant orator, a proud Jew and a true war hero. That said, he has taken steps that I can't approve of, like releasing terrorists and freezing housing (lest the left lead you to believe he's all 'build baby build'). Do I blame him for his frosty relationship with Obama? Nope. I believe Obama hates Israel and hates Bibi more for not capitulating more to the Palestinians. I also think that, thank G-d, Congress and the vast majority of Americans support Israel and know how right Bibi is on it's peace and secuirty. But he has been in office for quite a while. And if it were up to me, we'd have new (cough, Bennett) blood as prime minister, but now is apparently not that time. And so we have Bibi from Likud or Tzipi Livni/Isaac Herzog (yes, they are going toshare the prime ministership, how bizarre?) from the entirely misnomered "Zionist Union." Those are the options. And whoever can make up a larger coalition will be the leader(s) of the country. And if, G-d forbid, that is Livni/Herzog, I believe we are in troubleover here. So this is where the dilemma sets in. Do I vote with my heart- for a party whose platform represents me most closely? Or do I vote for Likud, who needs right-wing votes in order to stay in leadership? My cousin certainly thinks so. He's every bit as right-wing as me, but tries to convince me constantly to support Likud. To him, Iran is the main issue here, and he knows Bibi is the only one able to deal with the threat (probably true). He sends me videos, articles and slogans daily, trying to sway my vote. 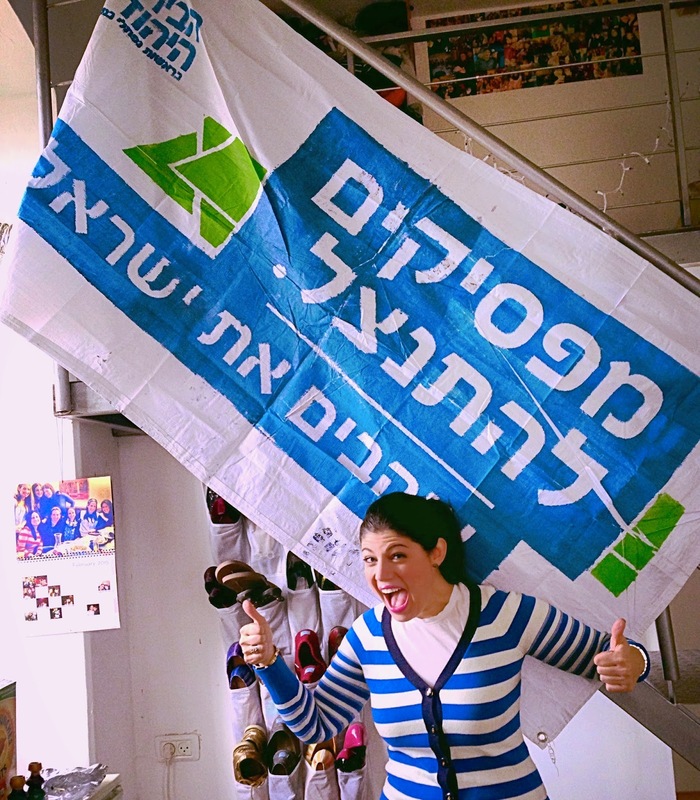 Do I really believe the tides of the Israeli election turn through me? No. But I did become one of several million votes in Israel, rather than one of hundreds of millions of votes back in the US. And so, in raw numbers, my vote does matter more here! What to do?! To get a grasp on the situation, I signed up for an event where candidates from each major party represented their party's positions to young olim like myself. The experience was such a trip that it needs it's own blog post to truly do it justice. So stay tuned for Part 2, okay? Thanks, you're the best!